Italian restaurant Qvintessenza set out with great intentions. The site says that the owner, clearly a lover of great wine, wanted to bring the best of Italian produce to his restaurant. And despite an awkward location on noisy Borough High Street in between Elephant and Castle and Borough stations, Qvintessenza is spacious, cosy, with lovely wooden surfaces, and lines and lines of wine bottles. Italians often joke with seriousness how the magic ingredient in their food is simply love. That certain je ne sais quoi, the careful throwing of great ingredients together, where nothing extra is added other than attentiveness. Provenance means a lot. You need to know the source to guarantee the quality of ingredients when there’s so little to hide behind. So all the more disappointing that the food that followed was not very good. No, not inedible, but so non-descript and lacking, well, in love, that we couldn’t help but feel this is a place that stopped caring. We know how disheartening it could be for staff to stay motivated when the numbers of punters dwindle (which we sense may be the case at Qvintessenza), but black slates and large square plates can’t prop up the lack of attention. To kick off we asked for a basket of homemade bread – a joy and pride of Italian restaurants across the globe. Here we got a few small slices of bread at a highly overpriced £3.50. Furthermore, the bread had been shop bought despites claims of being homemade. Burrata cheese (mozzarella filled with cream) with Parma ham (£12.50) said to be matured for 26 months was just fine, but it was difficult to enjoy to the dish fully without any proper bread to soak up the flavours. 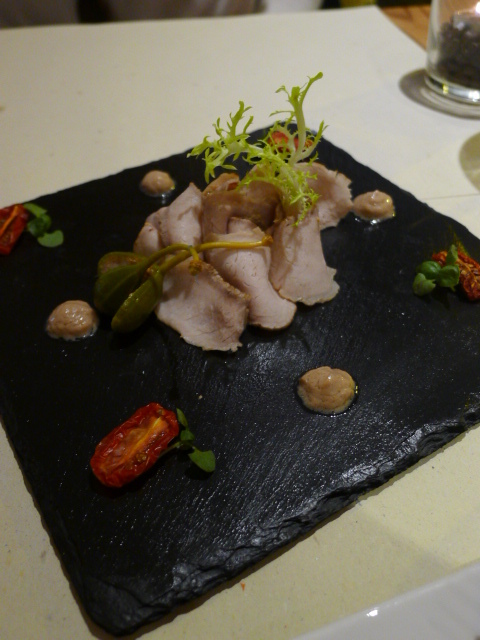 The classic Vitello Tonnato (£11.50), thin slices of veal which normally slathered in a generous amount of unctuous tuna sauce, was here served on a black slate with a few blobs of sauce which left us eating very dry slices of meat. A plate of seafood (£14) with a stew of little octopi, grilled king prawns, a scallop in shell, tasted ok, but lacked any freshness, zinginness or definition of flavour. Had the octopus stew in tomato sauce been bought in Tesco deli section for £3 we would not have complained, but here we felt disappointed, especially as the scallop was also heavily overcooked. Carbonara with sword fish (£13.50) is usually a lovely Sicilian dish where the usual cured pork is replaced with smoked or salted fish. 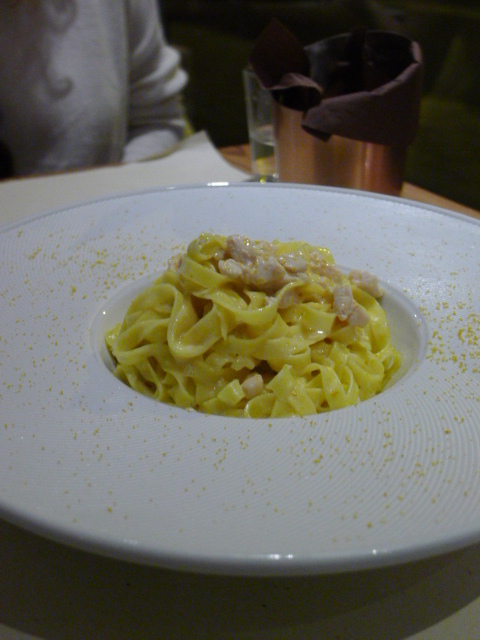 This was probably the nicest dish we had during the evening, despite the fact that the fish lacked the pungency we would have expected and the sauce could have done with another egg for that perfect Carbonara creaminess. 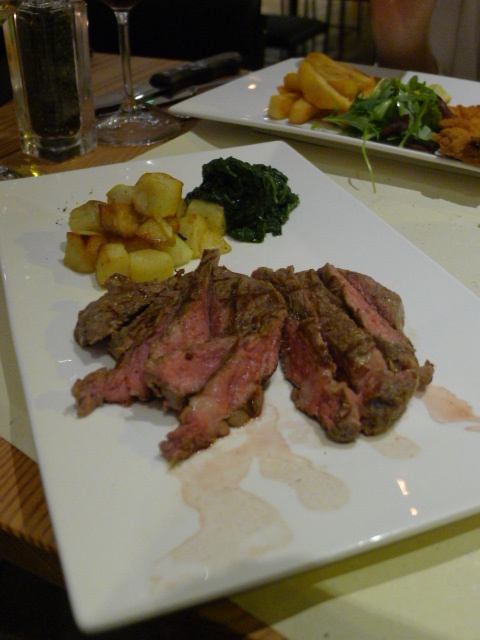 The rib eye steak (£24) was served medium cooked as we’d asked, and was tender but the meat lacked flavour. However it hadn’t been rested properly and was bleeding onto the plate. Accompanying the steak were small cubes of not quite crispy roast potatoes. 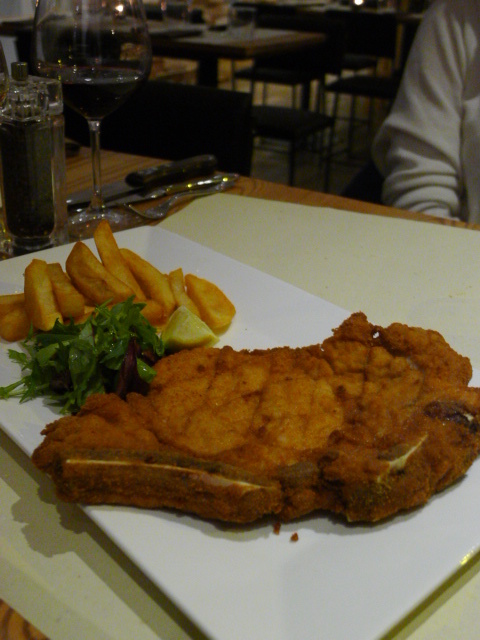 As our other main we opted for another classic of veal Milanese fried in breadcrumbs (£16). The meat was quite dry, missing any buttery flavour you’d normally get from an escalope shallow fried carefully. Also the crumbs weren’t crispy. We hoped the desserts might salvage the overwhelming averageness of the dinner, but the home-made gelato (£2.50 per scoop) was simply wrong. It had crystallised (was icy) and was quite bland. 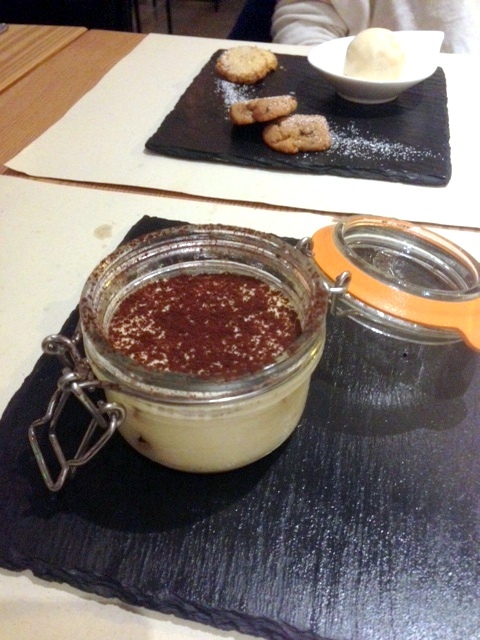 A tiramisu (£5.50) was better but did not particularly shine. 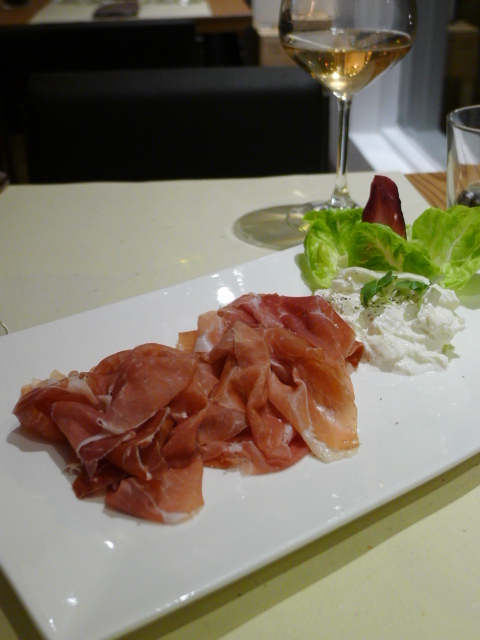 Oh, but a glass of Barberra d’Asti (£7.50) was great though, just as our espressos. The irony. We really wanted this Italian to be a little hidden gem, but alas. Especially with a thriving London foodie scene bursting with good restaurants, it was hard to recommend Qvintessenza over others. The service was attentive enough that even the fact that one of our waitresses struggled with English, this seemed like a cute inconvenience. Note: Blog post by Katrina from Russian Revels and myself. 1) The fun list of all Italian, some quirky, wines. 2) Smiley (if struggling with English at times) service. I like you blog so much and I can see it really has a lot of potential. It is good to see someone who is also from Hong Kong doing food review from London. I will keep reading your blog. Just an advice, I think your content is really good but I do think it need some proper web design to spread your content. At the moment, the contact form is not showing the footer and the theme isn’t quite suitable for your blog I think.If you can find a good blog theme in WordPress and customise it, I am sure you will drawing traffic from google.